Studied Impact in Abu Dhabi came to our attention when they publicized a power plant they designed that doubles as a residence. The firm comprises a dynamic couple, architect and artist, who merge their environmental concern with creativity in very interesting ways. They are also the energy behind the Land Art Generator Initiative (LAGI), which is staging a unique interdisciplinary design competition. LAGI brought us the solar thermal music projects inspired by Egyptian history, and encouraged solar vs. nuclear power for the UAE. 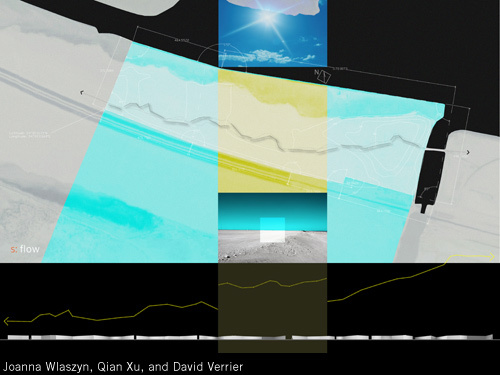 Now we’d like to introduce one competition submission, an art-meets-nature-meets-clean-energy installation designed by Joanna Wlaszyn, Qian Xu, and David Verrier. If you can imagine walking along a pale shore, and if you can imagine that shore intersecting with the sea, then perhaps you might also be able to envision a curved line of glass following that ecotone, or intersection. If you can, then you have become a part of the s: flow design, in a sense, because your role as viewer is crucial to the project’s success. S is for sun, sunlight, solar, sunshade, see, sky, and for sand; this land art installation nudges the viewer to question “the visual dimension of distance and length perception,” according to the designers. In addition, s: flow draws attention to the ever-cyclical nature of light’s play, to the notion that the only constant in life is change. While moving along the installation, the sun reflections on the glass continuously change and create the flow of sunlight motion. Each time of the day the installation takes a whole new appearance in a permanent dialogue between light and shadow, nature and technology, and especially between man and his environment. 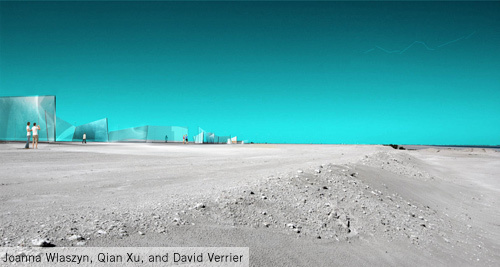 This visual interaction, say the project’s designers, is enhanced by the stark contrast between the sky and the reflective sand. While art is a meaningful end in itself, since good art encourages spectators to re-think an ordinary object, or turn a concept on itself in order to see it in a different light, LAGI and s: flow are compelling because that artistic twist is applied both to nature and clean energy production. The standing glass, which transparency is maintained with “light supporting metal load-bearing structure,” is composed of reflective glass that provides a large feeding grounds for solar energy. This is harnessed with Spherlar Micro Solar Cells that absorb both direct and indirect sunlight, on both sides, and provide 80% high transparency. And to delineate between private and public space, an invisible alarm placed on the ground triggers sound to alert hapless intruders. The winner (s) would have be informed on August 9th, but the public will not be informed until the award ceremony in January. The winning team will be awarded the prize at the 2011 World Future Energy Summit in Abu Dhabi as part of the Land Art Generator exhibition at Masdar stand at WFES. The winning prize is sponsored by Masdar. Although the competition is closed, each of the submitted pieces continues to distribute energy to the power grid, adding a brilliant punch to an already groundbreaking project. The UAE has taken a lot of heat, but it’s impossible to ignore the ingenuity that the region generates. All puns intended.